According to Diagnostic and Statistical Manual of Mental Disorders (Fifth Edition), specific learning disorder is a neurodevelopmental disorder with a biological origin that is the basis for abnormalities at a cognitive level that are associated with the behavioral signs of the disorder. The biological origin includes an interaction of genetic, epigenetic, and environmental factors, which affect the brain's ability to perceive or process verbal or non-verbal information efficiently and accurately. 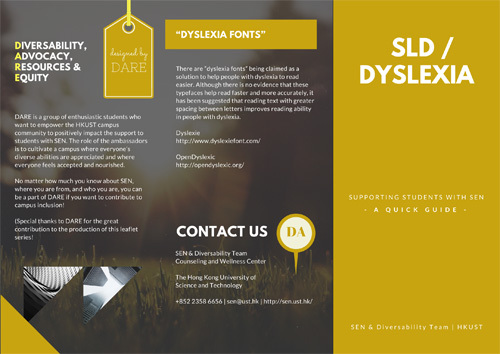 Students with learning disabilities usually present persistent difficulties learning key stone academic skills including reading of single words accurately and fluently, reading comprehension, written expression and spelling, arithmetic calculation, and mathematical reasoning. They demonstrate a significant discrepancy between their levels of expected achievement and actual performance. Dyslexia: Disorder of reading, writing and spelling. Dyscalculia: Marked difficulty in making arithmetical calculation or computation, remembering mathematical facts and concept of time. Dysgraphia: Inability to write coherently, problems with accurate spelling and organizing ideas, illegible handwriting. Specific learning disorder commonly co-occurs with neurodevelopmental (e.g., ADHD, communication disorders, developmental coordination disorder, and autistic spectrum disorder) or other mental disorders (e.g., anxiety disorders, depressive and bipolar disorders). Faculty and staff members are encouraged to make referrals to formalize the helping process, and facilitate documentation and liaising with the source of referral. The DiversAbility Team will outreach the student concerned.